Expand – The ability to drive additional value from your customers and grow a substantial base of advocates to assist your company with attracting and acquiring new prospects. So before we get ahead of ourselves and jump right into launching client programs – let’s do some strategic thinking first. 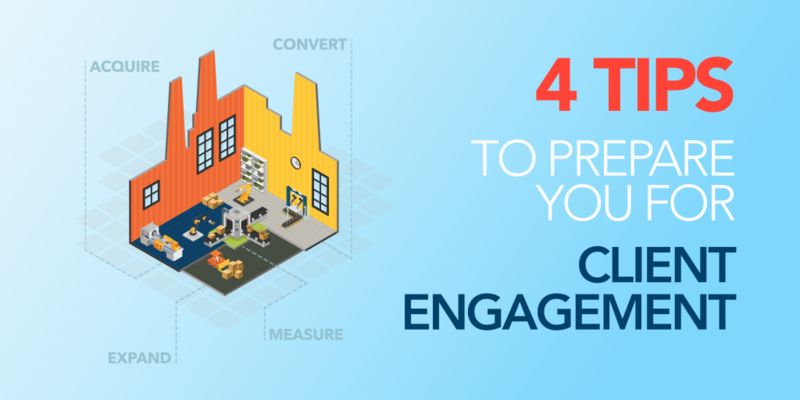 I’ve organized some simple categories that can help you establish the needed structure to successfully build and grow your client engagement programs. Establish an agreed-upon definition of what a client is and what fields you will use to make sure there is consistency across the teams and the systems. This agreement becomes crucial when we need to understand how to work with new leads, new lines of business, or new geographical locations within existing client accounts. Leveraging both account and contact values will provide significant value in preparation for client onboarding and engagement. Once you have the taxonomy outlined, it should be a simple exercise to align the ownership of the various client stages. Establish a clear process for managing the transition from qualified opportunities to new clients and outline when, how, or if marketing should engage. Putting this process in place also sets the stage for an overall client engagement strategy, so it is critical that all teams – marketing, sales and account/client management – are in alignment and frequently communicate their respective programs to keep the client experience central and your messages consistent. Outside of getting your data organized to help you identify, segment and engage your clients, establishing a formal process to capture your client’s input is critical to long-term partnerships and loyal advocates. Showcase client successes on your website, in case studies, in your online forums, etc. Internal alignment and agreements are where we find most clients need to focus. Getting prepared is going to accelerate the discovery and delivery time for your internal projects as well as exponentially impact the success you have with vendors and service providers you rely on to help you strategize, execute and manage your end-to-end client engagements. For those of you running client engagement programs: we would love to hear about your success stories – as well as your trials and tribulations – about driving strategic growth and expansion of your client base. If you struggle with your client engagement programs, call on us for help. Renee Gellatly brings over 20 years of industry insight to the DemandGen consulting team. She’s had the benefit of working with DemandGen as a client and now provides modern marketing thought leadership and expertise on sophisticated demand management strategies and solutions to our clients. Renee has worked with global marketing and sales teams from industry pioneers Oracle, Adobe, Cisco, NetApp and GE to understand their complex business objectives and to build out frameworks and programs that optimize technology for accelerated pipeline management and evolving customer retention and growth. She has a true passion for marketing technology and enjoys working with clients to develop a roadmap for continued measured success.